You can't tell the Cedar Rapids Kernels without a scorecard with all the changes on the ballclub in the last few days, but one thing remains the same. Cedar Rapids scored four gift runs in the seventh inning Wednesday night and clipped the Burlington Bees, 5-2, before 2,234 fans at Veterans Memorial Stadium. The Kernels raised their record to 53-37, the third-best overall mark in the Midwest League, and they've done it with 45 different players in those 90 games. "It's been a revolving door, unfortunately," said Manager Jake Mauer. There have been injuries, promotions, demotions and players released by the Minnesota Twins organization. The Kernels have made five roster changes this week, but it didn't bother them Wednesday. Yorman Landa, fresh off the disabled list, struck out three batters in his one inning on the mound in relief and picked up the victory on his first day back on the job. The Cedar Rapids Kernels will have a new look when they host the Burlington Bees Wednesday night. The Kernels and Minnesota Twins announced Wednesday morning that pitchers Yorman Landa and Chris Mazza have been activated from the 7-day disabled list, first baseman Tyler Kuresa has rejoined the Kernels from Elizabethton, and catcher/first baseman Jorge Fernandez has been placed on the DL with a broken right hand. The Kernels also confirmed that Brett Doe has been promoted to Fort Myers. Landa pitched in one game for the Kernels at Peoria May 19. He has made seven appearances during a rehab assignment with the GCL Twins, posting a 1-0 record, 0.00 ERA and one save. The Twins selected Mazza in the 27th round of the 2011 draft from Menlo Junior College. He made 25 relief appearances for the Kernels in 2014, posting a 4-4 record and 2.79 ERA. He has appeared in five games on a rehab assignment with the GCL Twins with no record and a 3.00 ERA. Kuresa started the season with the Kernels and was assigned to Extended Spring Training on May 29. In 36 games with Cedar Rapids, he was batting .194 with a home run and 11 RBIs. He played in 17 games at Elizabethton, batting .241 with four homers and nine RBIs. Fernandez has played in 56 games for the Kernels and is batting .215 with three homers and 25 RBIs. The Kernels currently have 24 players on their roster, which is one under the maximum. Brett Doe has been been promoted from the Cedar Rapids Kernels to the Fort Myers Miracle, according to the rosters for both teams. The Kernels and Minnesota Twins have not announced the move, but Doe has been removed from the Kernels roster on the club's website and has been added to the Fort Myers roster. Doe, 25, hit .285 with three home runs and 19 RBIs for Cedar Rapids in 46 games. He was used as a first baseman, catcher, designated hitter and third baseman by the Kernels. The Twins picked Doe in the 38th round of the 2014 draft from Baylor. The Cedar Rapids Kernels and Minnesota Twins announced Tuesday that pitcher Zack Tillery has been placed on the 7-day Disabled List, retroactive to July 12, with a left calf strain and pitcher Brandon Bixler has been released from the team. Tillery has made 18 appearances (nine starts) for the Kernels, posting a 5-4 record, 2.67 ERA and one save. 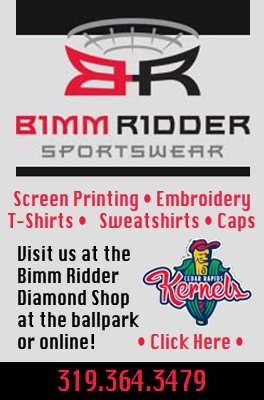 Bixler was activated off the DL on June 24 and made six relief appearances for the Kernels, posting a 1-1 record and 6.30 ERA. 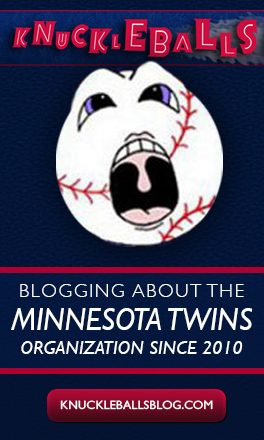 The Twins did not announce any corresponding moves. The Kernels roster is at 23 active players, two below the Midwest League maximum of 25. The Kernels return to Perfect Game Field at 6:35 p.m. Wednesday at Veterans Memorial Stadium to host the Burlington Bees. GENEVA, Ill. - The Cedar Rapids Kernels fell to the Kane County Cougars, 4-2, in their series finale Monday afternoon before 6,547 fans at Fifth Third Bank Ballpark. The win gave Kane County its seventh straight series win. Cedar Rapids (52-37) took the opening lead for the third time in the series with an unearned run in the top of the first. Tanner English led off the ballgame with a double to left field. Nick Gordon drew a walk, giving the Kernels runners on first and second. A Josh Taylor wild pitch advanced English to third and Gordon to second. Two batters later, Max Murphy reached on a throwing error. The error allowed English to score from third. Kane County (52-35) countered with a run in the bottom of the first. Ildemaro Vargas led off with a double to left-center. Chuck Taylor followed Vargas with a walk, giving the Cougars runners on first and second. Colin Bray reached on a fielder's choice, giving Kane County runners on the corners with one out. Joe Munoz tied the game at 1-1 with a sacrifice fly to center. The Kernels took a 2-1 lead with a run in the seventh. English reached base for the third time with a two-out single to right. Gordon followed English with an RBI double to right field. Kane County grabbed a 3-2 lead, its first advantage of the afternoon, with two runs in the seventh. Munoz led off with a single to left. Two batters later, Quinnton Mack was hit on the left shoulder, giving the Cougars runners on first and second. Henry Castillo tied the game, 2-2, with an RBI single. Two batters later, Victor Reyes drew a walk, loading the bases full of Cougars. Vargas gave Kane County a 3-2 edge with a bases-loaded walk. 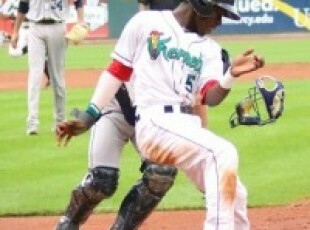 GENEVA, Ill. - Ildemaro Vargas belted a pinch-hit walk-off home run in the bottom of the ninth inning Sunday to give Kane County a 3-1 victory over the Cedar Rapids Kernels before 6,169 fans at Fifth Third Bank Ballpark. The two-run home run was a line smash that slipped just over the wall in left field. It came with two outs and also scored Henry Castillo, who was at first base. It was the second home run of the season for Vargas. Brandon Bixler (1-1) allowed the home run and took the loss, allowing two runs, one hit and one walk in two-thirds of an inning. Zac Curtis (3-3) earned the win after tossing a scoreless top of the ninth. Kane County (51-35) scored first with a run in the fourth inning. Marty Herum led off the frame with a double to field field. A Colin Bray sacrifice bunt advanced Herum to third. Michael Perez followed Bray with a sacrifice fly to center. Cedar Rapids (52-36) tied the game, 1-1, with a run in the eighth. Sean Miller led off with a single through the right side. Tanner English reached on an error, giving the Kernels runners at first and second. Nick Gordon followed with an RBI single up the middle. GENEVA, Ill. - The Cedar Rapids Kernels evened their series with the Kane County Cougars Saturday night with a 2-0 shutout before 5,685 fans at Fifth Third Bank Ballpark in the northwest Chicago suburbs. Three Kernels pitchers limited the Cougars to five hits. Randy Rosario tossed six innings and got the victory, with Cam Booser and Trevor Hilgenberger finishing the shutout in relief. Cedar Rapids (52-35) scored both of its runs in the second inning. Max Murphy recorded the first hit of the game with a leadoff single to center. Alex Real followed Murphy with a single to left field, giving the Kernels runners on first and second. Jorge Fernandez loaded the bases with a single to right. Two batters later, Brian Navarreto put Cedar Rapids up 2-0 with a two-run single to enter, plating Murphy and Real. The Cedar Rapids Kernels and Minnesota Twins announced Saturday that infielder Sean Miller has joined the Kernels from Elizabethton of the Appalachian League. The Twins selected Miller in the 10th round of the 2015 draft from the University of South Carolina-Aiken. In 11 games with Elizabethton, he was batting .209 with a triple and RBI. Miller will be active for Saturday night's game at Kane County. He replaces T.J. White, who was promoted to Fort Myers in the Florida State League this week. GENEVA, Ill. - The Kane County Cougars rallied to defeat the Cedar Rapids Kernels, 8-3, in the series opener Friday night before 8,463 fans at Fifth Third Bank Ballpark in the northwest Chicago suburbs. The Cougars plated eight runs in their last four at-bats for the win. Tanner English, Rafael Valera and Max Murphy had two hits for the Kernels (51-35). Brett Doe made his debut at third base for Cedar Rapids following the promotion of T.J. White to the Fort Myers Miracle. Zach Tillery (5-4) allowed four runs in 5.2 innings and took the loss. Cedar Rapids and Kane County meet again Saturday night. The Cedar Rapids Kernels and Minnesota Twins announced Friday that third baseman T.J. White has been promoted to the Fort Myers Miracle of the Florida State League. White played in 74 games for the Kernels, batting .230 with 10 doubles, five triples and 26 RBIs. He was selected by the Twins in the 18th round of the 2014 draft from UNLV. The Twins did not announce a corresponding move to replace White on the Cedar Rapids roster.